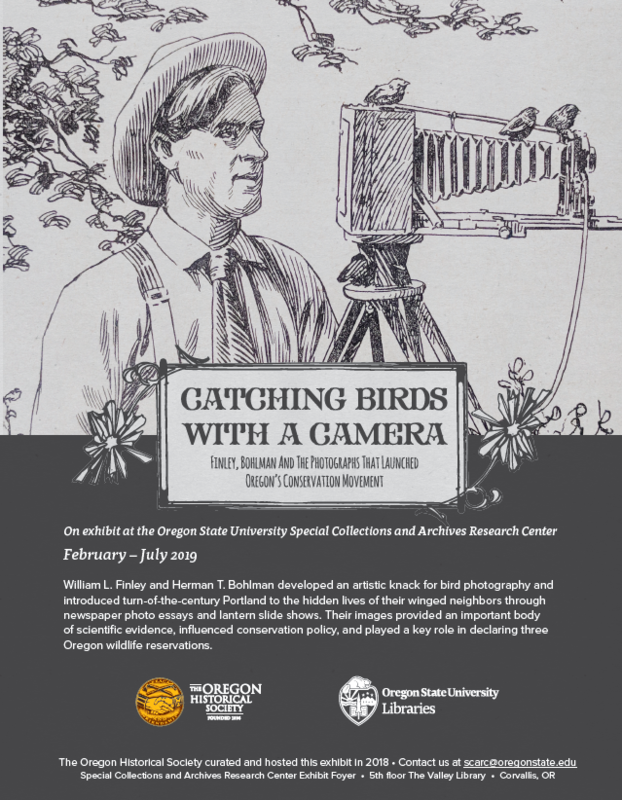 We are so excited to be hosting the Oregon Historical Society (OHS) exhibit “Catching Birds with a Camera: Finley, Bohlman and the Photographs That Launched Oregon’s Conservation Movement” from February – July 2019! 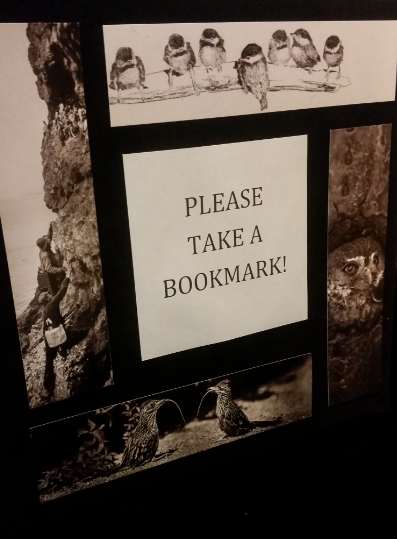 And now, photos of the exhibit! The “Getting Our Goat” video is available online – a very well spent 15 minutes of your time if you ask us. 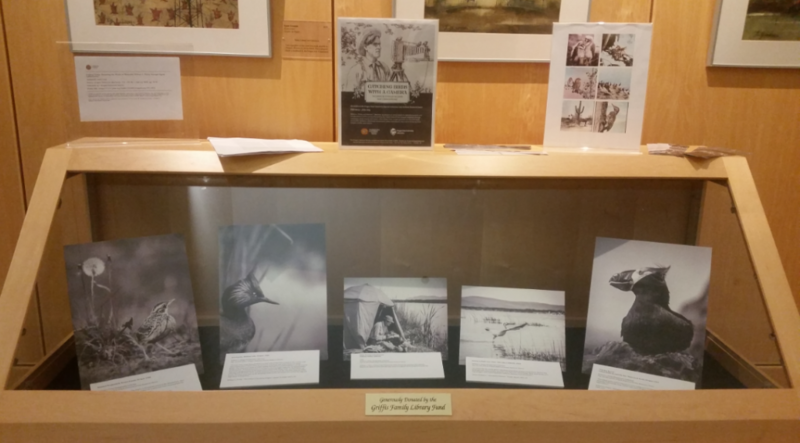 We hope you stop by in the coming months to view the exhibit! This entry was posted in Exhibit, Finley, Main Page on February 8, 2019 by fernandn. Enjoy this visual tour highlighting our signature areas (natural resources, the history of science, University history, and Oregon’s multicultural communities). Exhibited are a selection of books, artifacts and documents designed to give viewers an entrée into the wide variety of materials held in each of our signature collections. As the repository for and steward of the Libraries’ rare and unique materials, this exhibit explores the many ways that the Special Collections & Archives Research Center stimulates and enriches research and teaching endeavors through the use and preservation of historical collections and unique materials. Our collections include manuscripts, archives, rare books, oral histories, photographs, ephemera, audio/visual materials, and digital records. Make sure we’re open when you stop by! Our reading room hours are Monday – Friday, 8:30 am to 5:00 pm. This entry was posted in Exhibit, Main Page on November 3, 2012 by edmunsot. Priscilla West’s ART 494 class visited the Special Collections & Archives Research Center during spring term to see the illuminated manuscript Gradual in our collections. 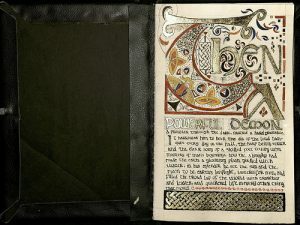 Seeing and experiencing a real manuscript, bound in leather and metal and written with ink on parchment, inspired many students for their final projects. 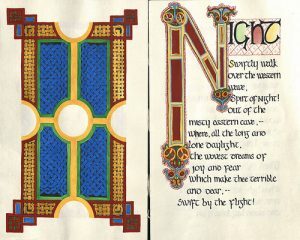 The goal of their final project was to incorporate paleographic analysis into the production of their own illuminated manuscript. The assignment required a text of 2000 words produced in a medieval or Renaissance style. Each student selected their own stylistic approach. Several students composed their texts, and others chose especially meaningful excerpts from favorite authors. 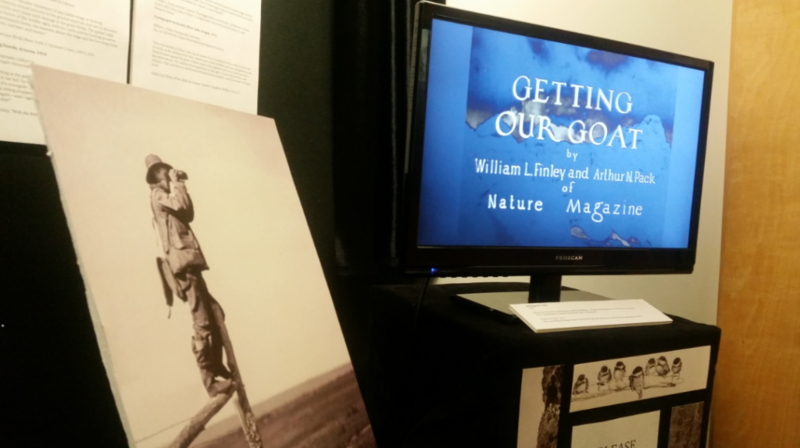 The students’ final projects are boundlessly creative, using a variety of media in both traditional and new ways. 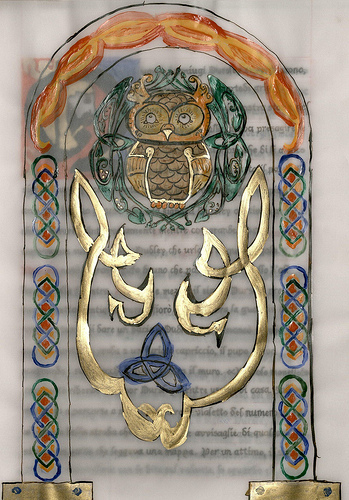 Many used gold leaf or gold ink in their works to mimic the intricate gold detailing of many illuminated manuscripts. 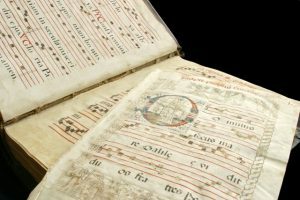 They found a multitude of ways to give an “old” look to paper and to duplicate the aged parchment of the Gradual and other manuscripts they saw: some stained the paper with tea, some burned the edges of the paper, some crumpled then flattened the sheets, some used a vellum-like paper. One student used actual sheep parchment! Several students were impressed at the metal studs used in the binding of the Gradual, and reproduced the look with upholstery tacks and gold thumb tacks. And though students were not required to bind their manuscripts, many chose to, and used an exciting spectrum of durable materials: denim, leather, faux leather, even rabbit fur! 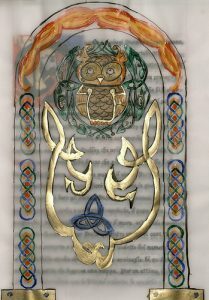 Through this fantastic project, students got a glimpse of the immense artistry and intense effort of medieval monks and scribes, and created their own lasting illuminated wonders. 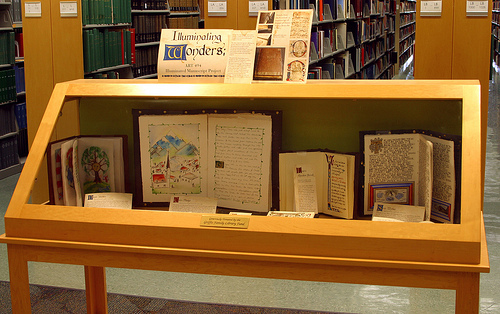 The display of the students’ projects will be available for viewing during normal library hours during September and October, just outside of the Special Collections & Archives Research Center on the 5th floor of the Library, near the elevators. You can also find a set on Flickr with more images for your viewing pleasure. If you have any questions, contact History of Science Collections Librarian Anne Bahde at anne.bahde@oregonstate.edu. This entry was posted in Exhibit, Flickr, Main Page on August 22, 2012 by edmunsot. 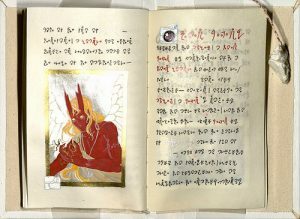 A Whole Month to Celebrate Archives! Celebrate Oregon Archives Month and the OSU Archives 50th Anniversary! 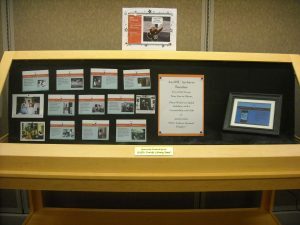 Check out our latest display for a look into the behind-the-scenes past of the Archives – you’ll find out 50 years worth of fun facts like who the first OSU archivist was and which campus buildings have housed the archives, plus you’ll get to see images of previous decades archives fashions and technologies. This entry was posted in Exhibit, Flickr, Main Page, Oregon Archives Month on October 2, 2011 by fernandn. Happy 100th Birthday to OSU Extension Service! Have you heard? OSU Extension turns 100 on July 24! And you know we love to celebrate with pictures, right? In honor of their birthday, the OSU Archives invites you to view our newly launched on-line exhibit: Oregon State University Extension Service: 100 Years of Putting Knowledge to Work. The exhibit compliments the Extension Tour of Oregon collection in OSU Flickr Commons. We’ll continue to launch new sets each Wednesday through the end of August. So if you aren’t already waiting with baited breath — or if you are behind in your viewing — you can still mark your calendars to catch more new additions. The Oregon Extension Service was established July 24, 1911 to extend the knowledge of Oregon’s Land Grant University to the rest of the state. Over the past century, hundreds of Extension agents have worked tirelessly to support that mission by engaging even the most rural of Oregon’s citizens to improve their lives at work, in the field, and at home. This exhibit is a look back at Oregon’s Extension Service and the people who have made it the program it is today. Learn more about the centennial on the Extension site. 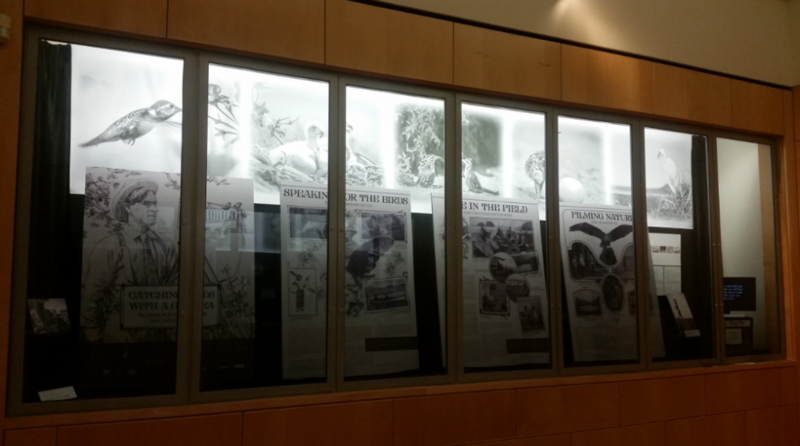 The exhibit is curated by Laura Cray a graduate student in History of Science at OSU. For more information, contact Tiah Edmunson-Morton, the Archives Public Services and Instruction Coordinator. This entry was posted in Exhibit, Extension_Centennial, Flickr Commons, Main Page on July 15, 2011 by edmunsot. 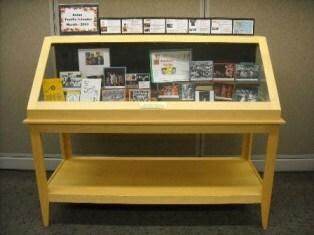 Check out our latest display in which we celebrate OSU! 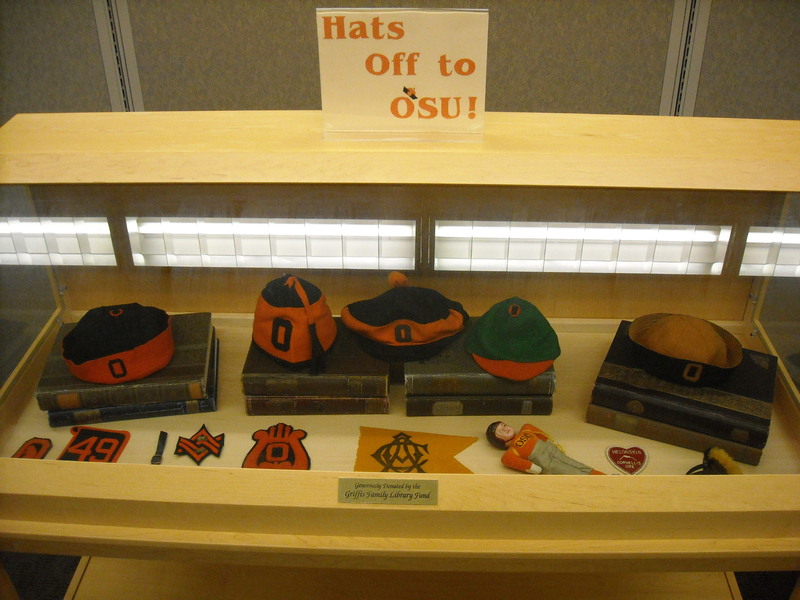 In our summer display “Hats off to OSU!” you’ll see hats, of course, along with patches, ear muffs, and even an OSU doll! 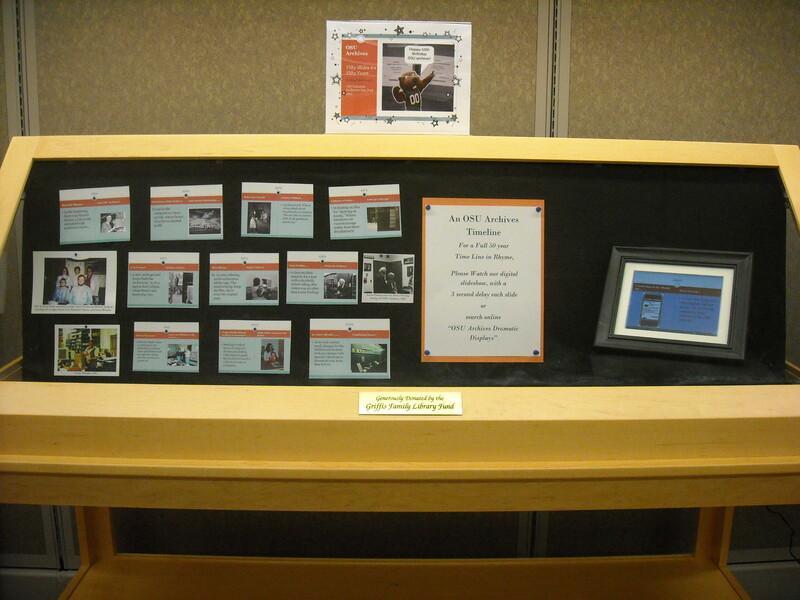 Come see the display in the 3rd Floor Archives Reading Room and check out the Digital Collection in Flickr! This entry was posted in Exhibit, Flickr, Main Page on July 1, 2011 by fernandn. The OSU Archives and Benton County Museum have joined forces to present an exhibition of historical photographs from the OSU, Horner Museum, and BCHS collections. Intrigued? The show is at the Moreland Auditorium (1101 Main Street in Philomath) and runs from June 10 to July 30. 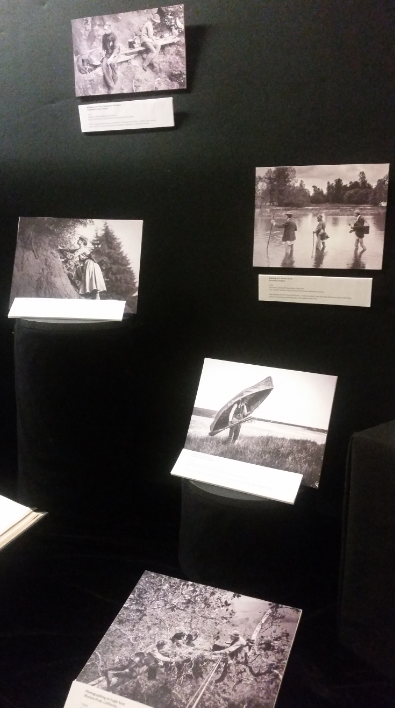 You’ll find works from nearly 100 photographs, plus biographical highlights of more than two dozen Oregon photographers or photo studios that date prior to World War I. Many of these rare, original, photographs have never been publicly exhibited. Enjoy a visit to Oregon’s past AND present! Located six miles west of Corvallis on Hwy 20/34, at 1101 Main Street, Philomath, Oregon, the Benton County Historical Society operates the Museum facilities for the preservation of history and culture. Its goal is to preserve the material culture of Benton County, Oregon. It strives to enrich people’s lives through interesting exhibitions and educational programs. The museum is open Tuesday through Saturday, 10:00 – 4:30. Admission is always free! Please call (541) 929-6230 for more information or visit www.bentoncountymuseum.org. 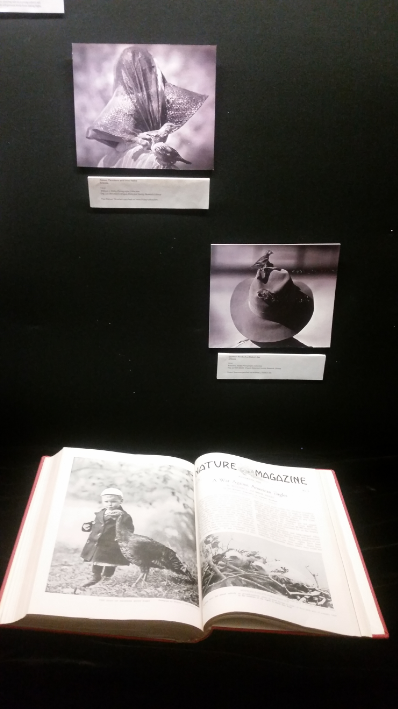 And, in case you are ready to do a little pre-research, photographers represented in the exhibit include Albert Abendroth, W.M. Ball, Chester M. Coffey,Conn and Underwood, Henry De Groot,Lottie Ebbert, William Emery, John Fulton,W.S. Gardner, L. Goldson, S.B. Graham, S.E. Gray & Co, E. Heslop, Robert M. Howells,George Leeper, C. Morris, Mrs. R. Morrison,R.C. Moseley, T.H. Mulkey, Pernot Brothers, E.W. Philips, David Stryker,Sydney Emmet Trask, Maggie Weigand,George Weister and the Woodruff Gallery. This entry was posted in archive_events, Exhibit, Main Page on June 9, 2011 by edmunsot. Want to know more? 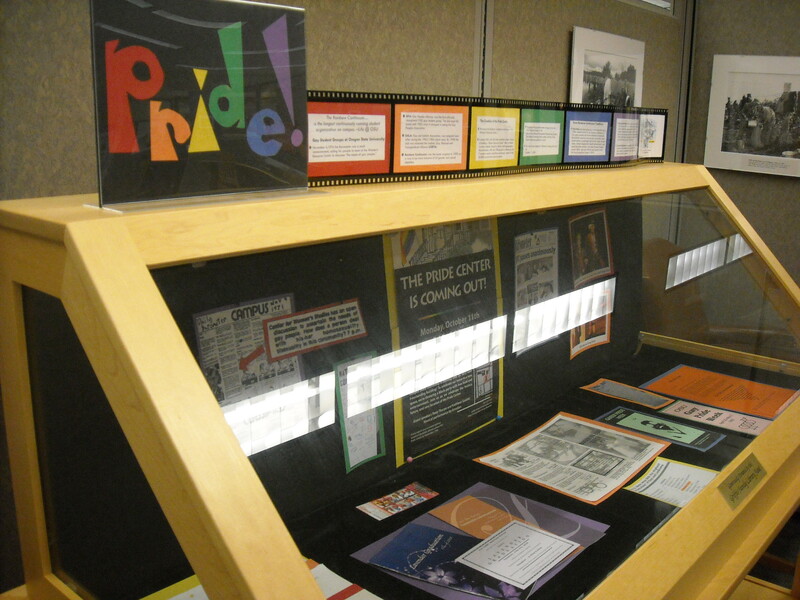 Come see the display in the 3rd Floor Archives Reading Room and check out the Digital Collection in Flickr! 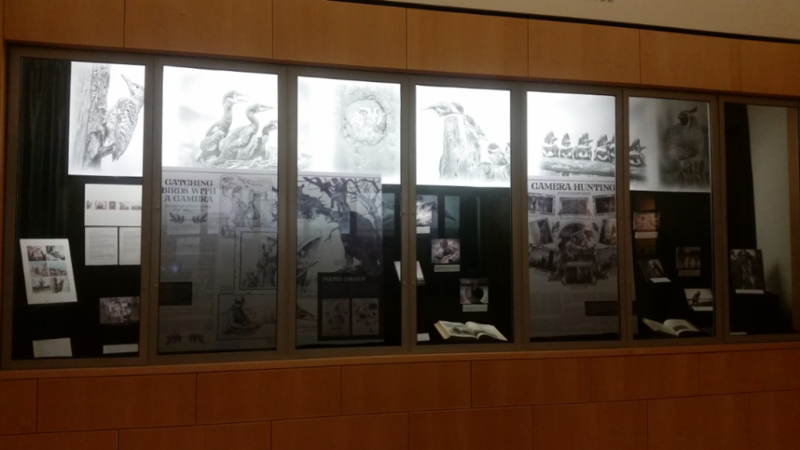 Exhibit curated by OSU University Archives student worker Kelsey Ockert. This entry was posted in Exhibit, Main Page, Oregon Multicultural Archives, Pride Month on May 31, 2011 by fernandn. Asian Pacific Islander Student Groups at OSU! Did you know that there was a Hui O Hawaii Club established in 1951? Did you know that just this Spring Term the Teow Chew Association was established? OSU has a long history of Asian Pacific Islander student groups on campus that host various events to share their traditions and cultures with the student body and Corvallis community as a whole. Exhibit co-curated by OSU University Archives Student Workers Kelsey Ockert and Ingrid Ockert. This entry was posted in Asian Pacific Islander Month, Exhibit, Flickr, Main Page, Oregon Multicultural Archives on May 3, 2011 by fernandn.